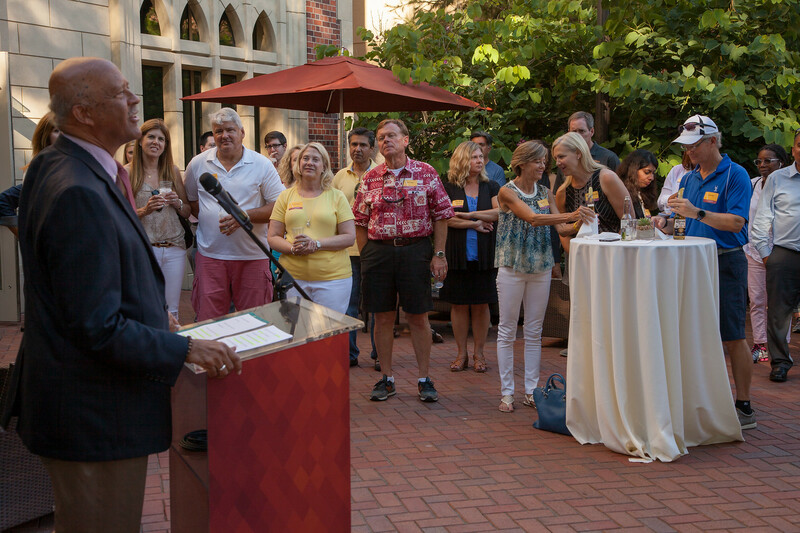 Dean Ernest J. Wilson III, Ph.D. (center) speaks with parents of USC Annenberg first-year students as they gathered in Wallis Annenberg Hall's Alumni Plaza on August 17, 2016 for a Move-In Day Reception. Every year, while incoming students settle in, Move-In Day @ USC Annenberg offers the parents of the new arrivals a chance to chat and mingle with faculty members and staff. Held the evening of August 17 at Alumni Plaza outside Wallis Annenberg Hall, the event began with a promise from Dean Ernest J. Wilson III. “We provide a unique setting for your students to really thrive here. At the end of the day you want to make sure your students have the greatest experience they can possibly have to be leaders in the field and really shape the field,” he said. Corii Berg is an Annenberg alumni, a member of the Annenberg Alumni Advisory Board and the USC Alumni Association Board of Governors, and the parent of an incoming first year, Eben. He spoke during Move-In Day about how Annenberg helped him as a student and how it set him on the path to his current role as Senior Executive Vice President of Business Affairs with Sony Television Entertainment. Berg’s son, Eben (B.A. Communication ‘20), was also at Move-In Day, but his thoughts were appropriately on the grand adventure he was about to begin. “I’m really excited to start and have my very first college class,” Eben said. Please click below to see photos from Move-In Day.